Famed British coin designer Thomas Humphrey Paget, whose art adorned the coins of 19 countries, died recently in England. He was 81. Paget, whose signature, “H P,” was carried by millions of coins around the world, received his training at London’s Central School of Arts and Crafts. He later studied at the Royal Academy schools under a Landseer scholarship. After establishing himself as a sculptor, he received his first Royal Mint commission in October, 1935. The Prince of Wales had just become president of the Master Mariners Society, and Paget did a portrait for a commemorative medal on the event. The Prince was so impressed by the likeness that he asked Paget to join two other artists in the competition for his new coins after his ascension to the throne as King Edward VIII. Paget’s work was chosen for the uncrowned portrait to be used on British and dominion coinage. A full set of patterns was prepared, but never issued, due to the abdication of the King in December 1936. 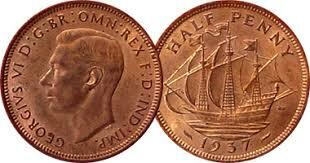 The artist and the Mint had great difficulty with King Edward over the direction his head should face on the coins. The king had changed the part of his hair from right to left earlier, and insisted that his likeness therefore face left. Tradition dictated that each British rule face the opposite side from his predecessor, and George V had also faced left. Paget covered himself by preparing a double set of dies, one according to Edward’s wishes, one for the mint, to be used if they were able to convince the king to return to tradition. 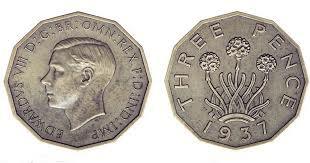 Among the new coins was a major innovation: a new 12-sided threepence, which would replace the tiny, inconvenient “thrup’nybit” then in circulation. A very few of these chunky nickel-brass patterns escaped the Mint, presumably for the inspection of the vending machine industry, which faced a major re-tooling operation to accommodate the new issue. When Edward left the throne in December, 1936, to marry Mrs. Wallis Warfield Simpson, he requested his brother, the new King George VI to retain Paget for his coinage. 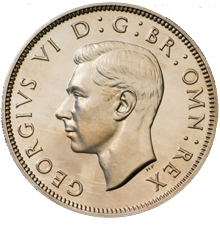 The artist’s uncrowned head of George VI appeared on the coins of Britain, Canada, South Africa, Australia and New Zealand, 1937-52. In the British series, he designed the reverse of the halfpenny, showing Sir Francis Drake’s ship, “The Golden Hind,” under full sail. This was to have appeared originally on Edward VIII’s coin, but graced the issues of George VI and Elizabeth II. This became the most numerous of any coin in British history. In the Empire, he created the reverse of the Cecil Rhodes commemorative crown of 1953 and the reverse of the British Carribean Territories’ 50-cent coin of 1965. An Arawak Indian maiden represent liberty on Paget’s obverse of many silver, cupronickel and bronze issues of the Dominican Republic. This was a 1937 reworking by the artist of a heavier 1891 original by French engraver Tasset. His commissions abroad were numerous. 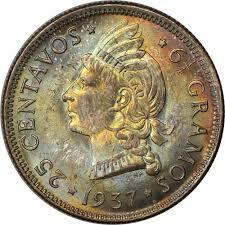 In Latin America, Paget created the graceful Arawak Indian Liberty head coins of the Dominican Republic; the Artigas-bust coins of 1953 for Uruguay; and Bolivia’s 10-boliviano bronze piece of 1951. One commission that Paget always recalled with sorrow was that of young King Faisal II of Iraq, who sat for his portrait while a student at Harrow. Five years later after the coins were released, the young king and several members of the royal family were murdered during a military coup led by Col. Karim Kassem. The short-lived South Arabian Federation used coins featuring a sailing dhow designed by Paget and issued in 1964. Area is now called People’s Democratic Republic of Yemen. The brief coinage of the Federation of South Arabia, with its sailing Arab dhow and stylized pomengranate, was a Paget design. Paget-designed commemorative 10 shillings, 1966. This coin was issued in honor of the 1916 Easter Rising in Dublin and portrays Padraig Pearse, provisional president, shot by the British. The legendary hero Cuchulain’s statue in the General Post Office appears on the reverse. Perhaps his last coin design was the Irish 10-shilling commemorating the 50th anniversary of the Easter Rising, 1966. In some ways, this concave-surfaced silver piece was as innovative as his British threepence, but was not as succesful in circulation. Paget married in 1943. His wife was noted sculptress Winifred Turner, whose father was an active member of the Royal Academy. The couple lived at Burwash Common, Sussex. Originally published in the June 19, 1974 edition of Coin World and reprinted here with permission of the publication and the author. 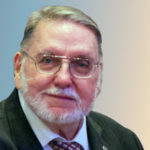 David Thomason Alexander is a prolific numismatic author and cataloger for over five decades. 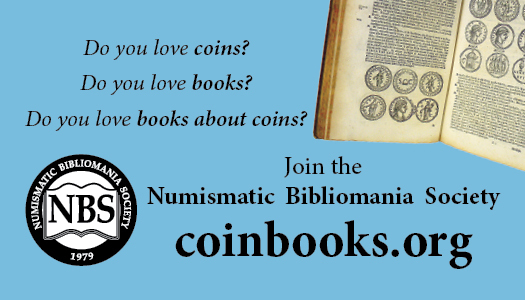 He is the founder of the Medal Collectors of America and a Fellow of the American Numisatic Society.